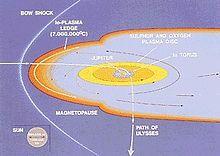 The path of the Ulysses spacecraft through the magnetosphere of Jupiter in 1992, shows the location of the Jovian bow shock. Waves is an experiment on the Juno spacecraft to study radio and plasma waves. It is part of collection of various types of instruments and experiments on the spacecraft; Waves is oriented towards understanding fields and particles in Jupiter's magnetosphere. Waves is on board the unmanned Juno spacecraft, which was launched in 2011 and arrived at Jupiter in the summer of 2016. The major focus of study for Waves is Jupiter's magnetosphere, which if could be seen from Earth would be about twice the size of a full moon. It has a tear drop shape, and that tail extends away from the Sun by at least 5 AU (Earth-Sun distances). The Waves instrument is designed to help understand the interaction between Jupiter's atmosphere, its magnetic field, its magnetosphere, and to understand Jupiter's auroras. It is designed to detect radio frequencies from 50 Hz up to 40,000,000 Hz (40 MHz), and magnetic fields from 50 Hz to 20,000 Hz (20 kHz). It has two main sensors a dipole antenna and a magnetic search coil. The dipole antenna has two whip antenna's that extend 2.8 meters (110 inches/ 9.1 feet) and they are attached to the main body of the spacecraft. This sensor has been compared to a rabbit ears set-top TV antenna. The search coil is overall a mu metal rod 15 cm (6 in) length with a fine copper wire wound 10,000 times around it. There are also two frequency receivers that each cover certain bands. Data handling is done by two radiation hardened systems on a chip. The data handling units are located inside the Juno Radiation Vault. Waves was allocated 410 Mbits of data per science orbit. On June 24, 2016 the Waves instrument recorded Juno passing across Jupiter's magnetic field's bow shock. It took about two hours for the unmanned spacecraft to cross this region of space. On June 25, 2016 it encountered the magnetopause. Juno would go on to enter Jupiter's orbit in July 2016. The magnetosphere blocks the charged particles of the solar wind, with the number of solar wind particles Juno encountered dropping 100-fold when it entered the Jovian magnetosphere. Before Juno entered it, it was encountering about 16 solar wind particles per cubic inch of space. There is various other antenna on Juno including the communication antennas and the antenna for the Microwave Radiometer. Two other instruments help understand the magnetosphere of Jupiter, Jovian Auroral Distributions Experiment (JIRAM) and Magnetometer (MAG) instrument. The JEDI instrument measures higher energy ions and electrons and JADE lower energy ones, they are complimentary. Another object of study is plasma generated by volcanism on Io (moon) and Waves should help understand that phenomenon also. Another issue that came up in 2002, was when Chandra determined with its high angular resolution that X-rays were coming from Jupiter's poles. Einstein Observatory and Germany's ROSAT previously observed X-rays from Jupiter. The new results by Chandra, which took the observations during December 2000, showed X-rays coming from the magnetic north pole not the aurora. Roughly every 45 minutes Jupiter sends out a multi-gigawatt X-ray pulse, and this is synchronized with an emission in radio at 1 to 200 kHz. Galileo orbiter and Ulysses solar orbiter picked up the radio emissions every 45 minutes. The radio emissions were discovered before the X-rays, they have been detected since the 1950s, and there is even Citizen astronomer project orchestrated by NASA called Radio Jove for anyone to listen to Jupiter's radio signals. Kilometric radio radiation was not detected until the Voyager flybys of Jupiter in the late 1970s. Two candidates for the source of the X-rays are particles of Solar wind or from Io. Waves was developed at the University of Iowa, and the experiment is led by a research scientist there. There are two main sensors for Waves, and these field signals to the frequency receivers. Both sensors are attached to main spacecraft body. The MSC is made of a rod of Mu-metal (a ferromagnetic alloy of nickel and iron) wrapped in fine copper wire. There are two frequency receivers that each cover certain bands, a high band and a low band, which in turn has different receiving sections. The receivers are housed in the Juno Radiation Vault along with other electronics. The DPU sends data to the main Juno computer for communication with Earth. The electronics are in the Juno Radiation Vault along with the receivers. Waves has detected radio emissions from the Jupiter auroras, the most powerful known in the Solar System to date. ^ a b Greicius, Tony (2015-03-13). "Juno Spacecraft and Instruments". NASA. Retrieved 2017-01-04. ^ a b 4, Geoff Brown / Published Jan; 2017 (2016-06-30). "NASA's Juno and JEDI prepare to unlock the mysteries of Jupiter". The Hub. Retrieved 2017-01-04. ^ a b c d e f g h Greicius, Tony (2016-06-29). "NASA's Juno Spacecraft Enters Jupiter's Magnetic Field". NASA. Retrieved 2017-01-05. ^ "Juno's Instruments | Mission Juno". Mission Juno. Retrieved 2017-01-05. ^ Sampl, M.; Oswald, T.; Rucker, H. O.; Karlsson, R.; Plettemeier, D.; Kurth, W. S. (November 2011). "First results of the JUNO/Waves antenna investigations". 2011 Loughborough Antennas Propagation Conference: 1–4. doi:10.1109/LAPC.2011.6114038. ISBN 978-1-4577-1016-2. ^ a b "Juno, and its University of Iowa-built instrument, about to reach Jupiter | The Gazette". The Gazette. Retrieved 2017-02-08. ^ a b c d e f "Puzzling X-rays from Jupiter | Science Mission Directorate". science.nasa.gov. Retrieved 2017-02-08. ^ a b John W. McAnally (2007). Jupiter: and How to Observe It. Springer Science & Business Media. p. 82. ISBN 978-1-84628-727-5. ^ "Juno Sends Back Incredible New Images of Jupiter | Planetary Science, Space Exploration | Sci-News.com". Breaking Science News | Sci-News.com. Retrieved 2018-01-24.